It's simple — with too much stress, you can't enjoy your life. It also puts your health at risk, and contributes to a host of problems — anxiety, insomnia, fatigue and more. Hundreds of published research studies verify these experiences. No other form of meditation has such a body of evidence supporting these benefits. A landmark study published in Hormones and Behavior found the TM technique reduces cortisol by 30%. Plasma cortisol is a stress hormone. 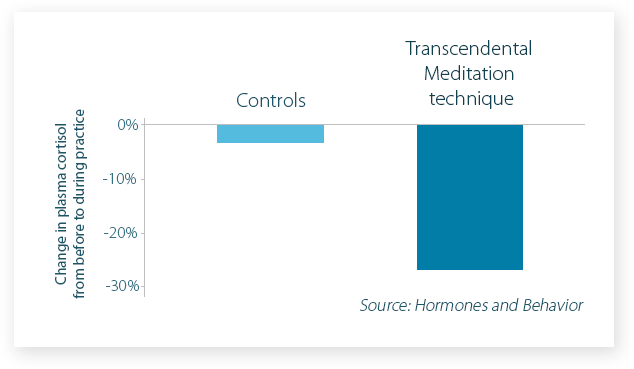 The study shows that plasma cortisol decreased during Transcendental Meditation, whereas it did not change significantly in control subjects during ordinary relaxation. Researchers at Stanford University conducted a meta-analysis of 146 independent studies on the effect of various meditation techniques on anxiety. 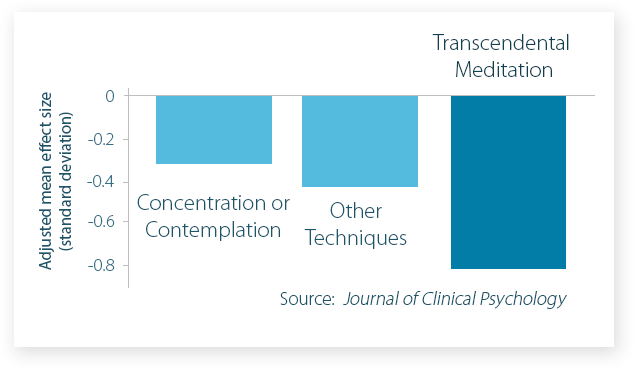 The study, published in the Journal of Clinical Psychology, found that the TM technique is twice as effective at reducing anxiety. Reference: Adrenocortical activity during meditation, Hormones and Behavior 10(1): 54-60, 1978.